>>> For faster results and the most up-to-date listing of products, view the complete range of Treo 650 cases in our Treo Accessories Store. A couple of months ago, someone emailed me asking what case I was currently using with my Treo 650 and if I could recommend one. Well, this question proved considerably more difficult and lengthy to answer than I had imagined but in the process I came to an important realisation. Namely, there is no ‘perfect’ case but instead there is one that is ideal for each particular situation. Before I get started there are two personal preferences that I have to mention. I have come to the conclusion that I don’t like cases with removable clips but have no problem with belt clips. 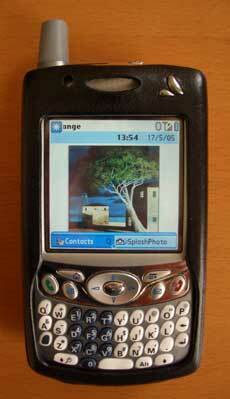 Additionally, I prefer my Treo to be ‘naked’ and thus both form-fit and skin cases have proven of little appeal to me. 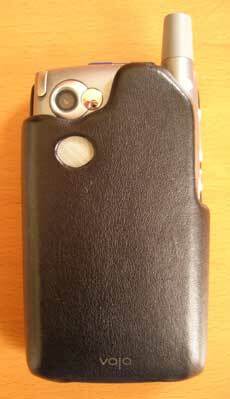 As you might recall, my favourite case for the Treo 600 was the Vaja iVolution and alongside this I used what I would term ‘basic’ cases which were my iPod case that had a belt clip and also the protective case that originally came with the Treo 600. I would switch between the cases depending on the occasion typically using the iPod one if I was out without a jacket and didn’t want to put the Treo in my pocket while the Treo 600 case I used if I needed added screen protection. 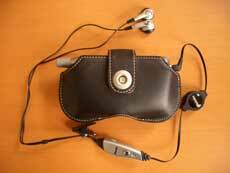 In the early days of getting my Treo 650 I continued to use both the iPod case and Treo 600 case (both below) while waiting for my new Vaja iVolution to arrive. Another basic case that really appeals to me is the Nutshell one but the only thing that annoys me about it is that it doesn’t have a headset jack cut-out. Actually, the Treo 650 Vaja iVolution ($100) below is less of a case per se than an elegant sleeve to protect your smartphone. This case proved to have the same construction and leather quality of my previous one and in this respect it did not disappoint. However, in sharp contrast to the Treo 600 model, I found typing on the keyboard to be extremely cumbersome as the leather edges sit both too high and too close to the outer keys. This fact alone had the effect that this case has gathered dust as I kept looking for one that was practical and that I liked. Of course the Covertec pouch case ($35) (left below) and Seidio Shield Holster ($28)are not music cases per se but I have found both to be the single most practical ones for listening to music while on the go. Why? Because they both 1) allow easy and quick access (in and out) to my ‘naked’ Treo, 2) allow me to have the audio jack inserted at the bottom without any problem and 3) provide very good protection for my Treo while on the go. 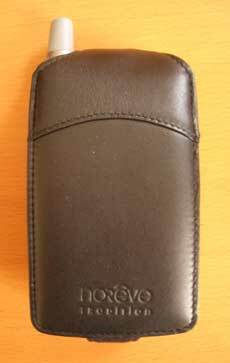 I had been eyeing Covertec’s case for quite some time and I have not been disappointed at all as both the quality of the leather, detailing and build are superb. I got the black leather model (the black outside + orange inside color is very cool) but I’m also thinking about getting the brown one for the summer. Seidio’s holster meanwhile is surprisingly easy to use and particularly fast getting the Treo in and out of it. The Treo sits face-in to protect the screen and it rests against a velvet surface lining so no worries about scratches. A small latch at the top (just above the camera) bends slightly backwards to release the phone – a very neat setup. As I mentioned before, I’m no longer a fan of cases that don’t allow for access to my naked Treo. Having said this, I can objectively provide you with my thoughts on two models that I have. The first is Noreve’s Tradition ($50) case which sports a good soft leather and inside velvet lining, a solid construction with a flip up that has two SD card pockets as well as a business/credit card pocket. However, Noreve’s oval shaped keyboard cutout is odd and not very practical for typing or accessing the Home and Menu buttons. Also, the leather bulges up around the screen when it should ideally rest flat. 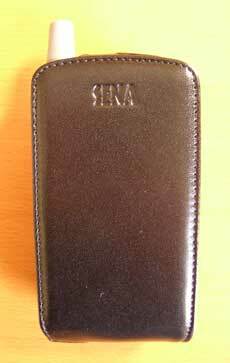 The other is Sena’s Magnetflipper case ($44) which has one of the most stunning and elegant leathers that I have come across – the full black shiny front face makes quite an impression and the sides are super thin. Also, as with Noreve’s, it also sports two SD card pockets but in contrast opens with the more practical flip down. Lastly, although the leather is still too close for comfort to the keyboard overall it proved to still be very usable. 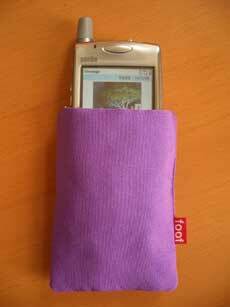 The foofpod fabric pouch ($28) is originally designed for the iPod and not our Treo but since both devices have nearly identical dimensions it fits perfectly. Foofpods are handmade to special order in Australia by some nice Irish ladies (don’t ask) and the company had been on my radar for some time when a couple of weeks ago I finally decided to order my own. I chose their Murasaki model made from premium Kimono polyester in super rich purple color and with a silver lining which I thought was just the right level of OTT that I needed for my Treo. What can I say, I love this pouch because it’s a completely unusual one and I typically use it to hold my Treo in a suit, jacket or coat pocket. Other fun fabrics include faux fur, Irish Tweed, denim and corduroy and there’s bound to be at least one model that will appeal to the more extrovert Treonaut. 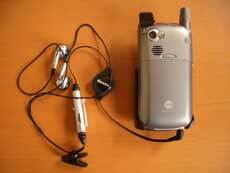 My only wish is that the company would actually start making these for the Treo proper and add an opening for the headset jack at the bottom. 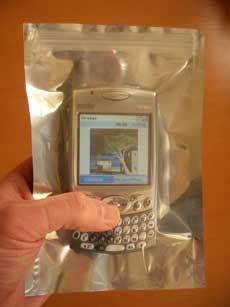 For this last case in the series, particular thanks must go to Brent who pointed out in a recent comment how he uses a simple ziplock bag to protect his Treo from dust and water at construction sites. I tried this with two different ziplock bags. The first a standard one and the second which totally by coincidence proved to be part of the original packaging of the Foofpod (image below right) and worked like a charm since it’s the exact size of our Treo. I had no difficulties making and receiving calls with either with people hearing me perfectly well (albeit mildly attenuated). Access to the keyboard and all function buttons was easy. The only thing is that the standard ziplock bag might be pierced more easily than the much more sturdy plastic used in Foofpod’s one (I don’t know what the material is called but it’s the same companies ship memory chips with). So, you might wonder which of all these cases I’ll keep using daily. Well, I’ll definitely stick to the Covertec Pouch, Seidio Shield Holster and Foofpod which are great products that each add to the enjoyment of my Treo in different cases (no pun intended). I use a cheapo generic 'leather' belt case I got while on holiday in Portugal for 3€! 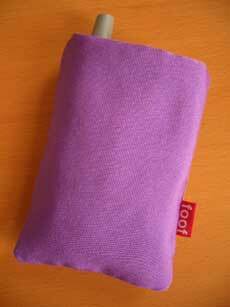 You can use also de ipod socks; pretty similar to the foot case; is there any US store we can find the foot case or just from Australia? ToolkiT - sure the range will be from $0 to $100 and we'll each find and choose the one that is most appropriate. Still, your €3 one does sound like a bargain! Alejandro - I hadn't thought about the iPod socks but it makes sense. 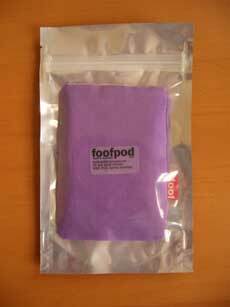 Also, I checked and it appears that Foofpods are only available shipped directly from Australia. 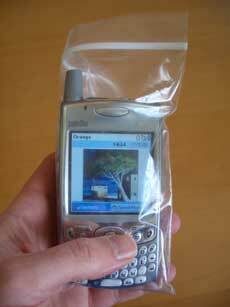 What about the "Innopocket Hard Case for Treo 650" for a good snug sturdy fit and best overall screen protection while still being able to SEE the screen? Although I do have to open the front to be able to hear calls in loud situations, I loved how my old Palm Vx opened up and then slid into my pocket, and this makes the best match. But I'd be interested in other opinions of something comparable. I am using the Timbuk2 case made for the Treo (available at PalmOne website for $20). It is awesome! 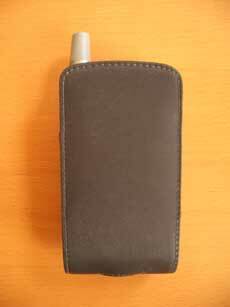 Headphone jack in the bottom, nice soft interior, multiple options for hooking it to your belt, bag, seat-belt, etc. Anyone who like their Treo naked like myself & Andrew will love this case. I've always preferred my Treo to be naked when I use it. I got the PalmOne side loading case with my first 600 more than a year and a half ago. It's held up great, and was well worth the $30. I did tweak mine a bit; it came with a hole for the headphone jack, but I cut this (to make a slot) so I could holster/unholster the phone without removing the headphone jack. On my commute this lets me tuck it away when walking, and pull it out to surf/email/game when on the train. Since the sides are ballistic nylon instead of leather, you can mod it to suit your personal needs (charger hole, etc) without it looking bad. Did you know Vaja has two ivolution cases for the Treo 650? You show a pic of the first model they came out with but not the most recent. Check it out at vaja's website. It's too bad you don't like skin cases and didn't review any, I really love my T650 flexiskin case from boxwave. It works perfect for me because it gives my Treo some "grip", protection, and makes the all the main functional buttons (especially the directional pad) easier to press than when they are naked (my fingers find the buttons too small and slippery on their own). It is true the silicone material could be a large lint magnet if you kept it in your pocket but my Treo hangs from my belt all the time so it doesn't impact me really. I admit that I really didn't like the whole pseudo-locking beltclip design they had before where you just had to put it in the clip sideways, twist, and hope your Treo didn't twist out but I just got one of the new designs where it actually locks into the beltclip and it works like a dream. I HIGHLY recommend it. Thanks Mr. Peabody - the Innopocket is one that has never personally appealed to me but I'll take it for a spin soon to test. Greg - Thanks, very cool indeed! I had come across this company years ago but never used their products - I'll try to get one and see. Camill - I can't seem to find that Mobiblu case that you mention anywhere - would you have a link? Thanks also for the RileyDog tip (I prefer leather but it's neat all the same). Kalel - thanks, I had seen the other Vaja case but it has the same problem with the leather borders being too close to the keyboard... Still, their color range is great. Riffix - thanks, as you point out the main issue that I had with the 'skin' type cases is that they are indeed a _huge_ magnet for dirt - mine was dirty within a day and I just gave up completely on that. Still, I know that like you many other people really like them. 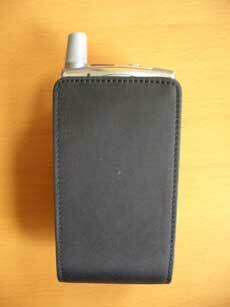 Nobody has mentioned the Krussel zippered case. I like to keep my Treo in my pants pocket (or jacket if wearing one), and therefore pocket lint and dust is a concern. 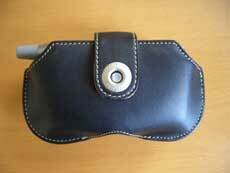 I use the Krussel case with clear plastic front and leather (zipper) enclosed back. As soon as I got it I took an xacto knife and cut the stiching for the belt clip attachment. With the clip gone it adds virtually nothing to the size and makes the unit resonably protected for carrying in the pocket. the current iteration of the Nutshell case has a cut out for the headset jack. 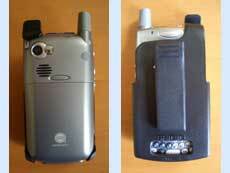 I'd like to see Boxwave make an ActiveCase for the Treo 650. Unfortunately they don't currently. The ActiveCase seems like a good balance of features. Basic impact protection, especially for the screen. Minimal size/bulk increase. Can see the screen with the device closed, should be able to use the phone and ports also. Would probably have cutouts for the navigators, and flip open for the keyboard. I have the Innopocket hardcase and really like the overall design. It's fits nice and snug, does a great job of protecting the Treo, and the aluminum gives a great finish. I did however find it very annoying to have to open it up to type. After two days with this case I busted out the trusty dremel and removed the lower portion of the case's cover. I even dremeled a slight arch just above the jog dial and the two upper menu buttons to make it a bit easier to press those. Now I only have to flip the lid when I have to use the touch screen. I basically created a Pacific Rim hard case for 10 dollars less, and little bit of custom flavor. Do you think a treo with egrips will fit in the covertec case? I found the perfect case for my Treo 650 while in Japan on business this past week. It seems to be a local Japanese brand, but as Japan is "keitai" (cellphone) crazy, I was optimistic I would find something suitable there - and I did. 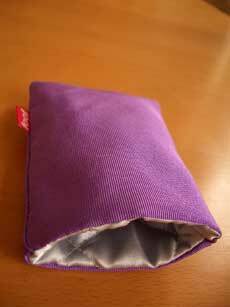 I found this case at the famous Tokyu Hands department store in Tokyo - the brand name is "Dr. Ion" and here is a link on yahoo that shows the item. it only cost 892 yen, or about U$8. It is very lightweight, has a snap/strap (to attach to your belt) and also a small carabiner-style clip on the back to attach to a bag or briefcase. I like that strap/clip because it is very thin - unlike those very bulky plastic quick-connect clips common on other cases. so the overall bulk of this case is very small. The foldover top closes by velcro and has notches to allow the antenna to fit. basically it is a perfect fit for the Treo. and I think it looks good, too. There was an almost identical model by the same manufacturer with solid vinyl covering rather than the meshlike outer covering of this version - but I prefer the look and feel of the mesh. I have the Covertec case. My only issue is that the case seems to answer my calls before I do. The buttons often get pressed while taking the Treo out of the case. This is extremely annoying when you don't want or have time to speak to the caller. I'm glad that someone saw the potential in recycling the packaging that came with the foofpod. We've been hoping that people use the Mylar Pak for others purposes. I use one for my iPod accessories, like the italk etc. The packaging is basically the dupont Mylar which is a tough plastic with foil pigment. They are also great for ice bricks for the esky for keeping beers cool. BTW: it's one girl and one boy running foof. no ladies as such. The first is an irritation in that the stylus is hard to get to (the edge is just at the edge of the leather and can be difficult to catch with your fingernail). The second doesn't bother me but I am sure you won't like it in that the cutout at the top is not big enough for the ringer on/off and the SD card slot. Since I don't use the SD card much it doesn't bother me. I do like the catch release on the belt as it requires pressing both releases together preventing accidental release of the Treo. I will at somepoint look to expanding the top cutout, but will wait until it becomes an issue. Just pickup up an aluminum case from http://www.wirelessground.com/ you forgot about that one.